← PAT POWER. Nuclear disarmament. Saul Eslake, one of Australia’s most highly respected independent economists, has sounded some sobering warnings about the impact of declining rates of home ownership (and rising levels of mortgage debt) on Australia’s retirement income system. He has also once again stressed the need for reform of the demand side of the supply and demand equation affecting housing affordability. In a report entitled No place like home – The impact of declining home ownership on retirement, commissioned by the Australian Institute of Superannuation Trustees (AIST), Eslake points to some fairly startling statistics lying beneath the broad numbers. 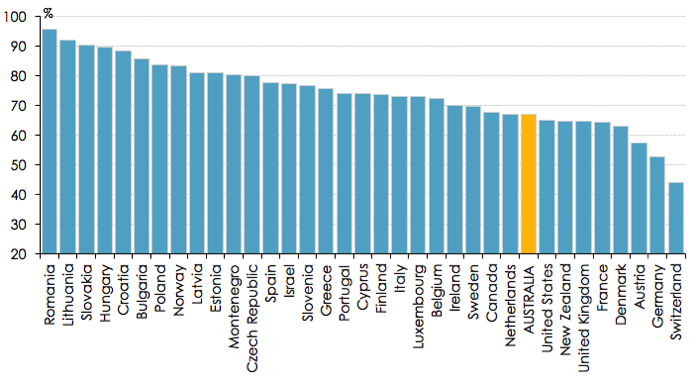 Even the broad numbers show that our rate of home ownership is not particularly high by international standards, despite the long talked about Australian dream. The following chart from the AIST report illustrates the point. Source: Reserve Bank of Australia (2015). Although overall home ownership in Australia fell by “only” 4% over the period from 1995-96 to 2013-14, the fall amongst all age groups other than the over 55s was much greater. For example, it was more than 3 times greater (13.5%) for those aged 25-34. Even in the 45-54 age group, it was twice as large (8.1%). The AIST report warns that these trends have some disturbing implications for Australia’s retirement income system, which implicitly assumes that the vast majority of retirees will have very low housing costs. He demonstrates that this assumption is becoming less valid over time. The AIST report reveals a material deterioration in the degree to which mortgage debt is paid off. Overall mortgage free home ownership declined from 61.7% in 1995-96 to 46.7% in 2013-14. The changes for some age groups are even more startling. For example, there was a near tripling between 1995-96 and 2013-14 in the proportion of 55-64 year old homeowners with outstanding mortgage debt, and for those aged 65 and over the proportion rose by 2 ½ times. The report also paints a much more nuanced picture of the trend towards renting than would appear from just looking at overall numbers. Despite the apparently minor increase in total numbers of people renting – up by only 2% (to 31%) between 1995-96 and 2013-14 – the changes are much greater for some age groups. The increase over that period in the proportion of renters aged 25-34 was 6 times larger (at 12%) than the overall figure of 2%. Not much less startling were the increases for older cohorts: 4 times larger for those aged 35-44 and 3 times larger for those aged 45-54. The AIST report also points to the diminishing role of public housing in the rental housing market, with adverse consequences for lower income renters in terms of rental affordability (as well as security of tenure). This reflects, at least in part, the decline since around 2001 in social housing as a proportion of overall housing stock. Quite apart from the increased housing stress for those affected by these falls in home ownership and rise in mortgage debt, they will also put more pressure on public finances, particularly the age pension and Commonwealth rental assistance. While the AIST report clearly accepts the need for more housing supply – something that government already acknowledges – it makes a strong case for demand side initiatives, including reforming negative gearing and the overly generous CGT discount. Eslake opposes cash grants and stamp duty concessions for first home buyers, which he says have the effect of artificially inflating demand for housing. He also stomps on the idea of allowing such buyers to tap into their superannuation savings to assist in raising a deposit. The AIST report ends with a range of specific suggestions as to how the Commonwealth and State governments could improve home ownership rates and help ensure that those who do own their homes are mortgage debt free in retirement. With the Federal Budget only some 6 weeks away, the AIST report and Eslake’s insights are not only well aimed but also well timed. Oliver Frankel is a former corporate finance and M&A lawyer, who has spent the second half of his career in finance, investment and management. Most recently, he has taken a strong interest in how to address the affordable housing crisis. This entry was posted in Economy, Housing, Politics and tagged housing affordability, Oliver Frankel, public housing, Saul Eslake, superannuation and housing. Bookmark the permalink. One thing Saul did not explicitly address was the failure of government to implement the AML. This is the latest scandalous report from Transparency International that identifies Australia as the worst, failing with a 10 out of 10 dirty money loopholes to flood our property market which has been and continues to be flooded with gargantuan sums of money. Legislation to implement the second tranche of anti-money laundering (AML) legislation covering real estate gate keepers has been gathering dust despite explicit criticism from the global regulator, the Paris-based Financial Action Taskforce (FATF), that Australian homes are a haven for laundered funds, particularly from China, as well as similar warnings from Austrac. In the meantime, dodgy Chinese money has piled into Australian property, in the process inflating house prices and pricing young Australians out of home ownership. Unlike most commentators/pundits/talking heads and so called experts Saul Eslake does not represent the rent seekers and vested interest groups and is all over this with solutions to the problems and must be heartily sick and tired of being ignored. This is Saul’s 2013 submission to the Senate subcommittee. In spite of superannuation being set up as a retirement ‘nest egg’, people have circumvented the intent by counting their super as ‘their money’, how dare they, and it is likely that many of them do plan to use their super to pay off their mortgage. That’s human nature, and a great example of ‘perverse outcomes’, but I can’t blame them. So much of the rampant live on credit period of the 90’s and 2000’s was based on them seeing large returns on their super statements and thinking that she’ll be right, mate. Entirely reasonable and predictable human behaviour. Unfortunately the policy setters at Treasury didn’t understand this, and the government, particularly the Howard years, were happy to promote the good times for political ends, but how can an economy continue to grow based on consumer credit? I asked the question way back then so can’t be accused of jumping on any bandwagons. Sustainable growth it the only growth worth the name, and much of our growth over the past 25 years has been unsustainable. You can be certain that the Trumble regime will do whatever is required to further benefit the rich at the expense of all others, including future generations. Such activity has been Trumble’s life’s ‘work’, if you can call merchant banksterism ‘work’.